The exhibition Youthquake! The 1960s Fashion Revolution , open now through April 7, is a collaboration between the students of our program and the Museum at FIT. Last week I sat down with curators Cassidy Zachary and Tracy Jenkins to talk about how it was created. I bring you our conversation in this two-parts post. I hope you’ll enjoy reading it as much as I enjoyed doing it. 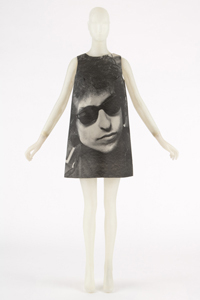 Dress with photograph of Bob Dylan by Harry Gordon, paper, black ink, 1968, England, gift of Estelle Ellis, Museum at FIT. Keren Ben-Horin: What is the premise of the exhibition? Cassidy Zachary: Youthquake! The 1960s Fashion Revolution explorers the dramatic impact of young people on fashion in the 1960s. We started by looking at the styles generated by the two leading subcultures of the day: the Mods and the Hippies, and how those styles influenced fashion, from the mass market to the haute couture. KBH: And what did you find? CZ: We found that “the world was all for youth now,” to quote Twiggy who wrote her memoirs in 1968. It was a really exciting time. Tracy Jenkins: We were given the broad topic of 1960s fashion with regards to Mods and Hippies. Our entire class began researching, an early angle that we perused was boutiques in London. We found that London was the epicenter of the youthquake and fashion revolution influenced by the Mod style. Mods were young men, in the mid to late-1950s, who were commissioning custume tailored suits based on costumes they have seen in Italian films, they were very fashion conscious and very specific about details, such as length and placement of vents and the fabrics used. Young designers really began to copy and emulate these looks, for men that was tighter fitting colorful clothing, for women it was styles like mini skirts and pants for all times of day. KBH: Did you find that the American market also adopted some of these styles? TJ: Absolutely. Boutiques were not only promoting new styles, it was also a new way to shop for these young people. England was slow to come out of the war, and young people finally had money to spend on consumer goods, so these are young men and women who are demanding a fashion of their own, and they are also using these stores as places to hang out, to see and be seen, to listen to music. The shops were often open very late, they would close up and the salespeople and the customers would go out together. So it’s really all about the life style. Prior to this, as a young person, you would go shopping with your parents, and you would dress very much like them in a junior size, so this was a radical transformation in that way. Then the boutique culture spread internationally, to places like New York and Paris. CZ: By 1965 there are over 90 million young people under the age of 24 alone, and they have all that money to spend, and so mass marketers are catering to them directly. The enterprising British businessman Paul Young comes to America, following a stewardess that he has falling in love with, they break up and he stays, and gets hired by JC Penny to open their new junior line. He is already realizing that Britain is the place to look for these young and exciting designs, so he hires Mary Quant to design for JC Penny in 1962. 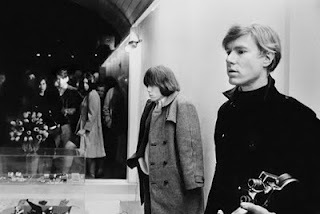 By 1965 he opens one of the first “Youthquake boutiques”- Paraphernalia in New York City. So mass market companies are realizing young people have money to spend and they are hiring hip new designers such as Mary Quant and Betsey Johnson, who begins her career in the sixties, to market to this powerful consumer class. TJ: Another way these styles are traveling back and forth across the Atlantic is on the backs of musicians, the Mod style particularly is associated with bands like the Beatles and the Who. The ways that fashion is being disseminated are expending, so there is not only the traditional fashion press like Vogue magazine, but there are television shows like The Ed Sullivan Show or Ready Steady Go! in Britain where people are seeing these young musicians, and emulating not only the clothing, but also the hairstyles and really the attitude. KBH: And also the movement. Now it’s no longer just a picture in a magazine. TJ: Yes, one thing to remember about these styles is that they are built for movement, for dancing. Mini skirts are very freeing, simple shift dresses are hanging away from the body, there is no structure, or the neo-corsetry of the 1950s. These are styles for young, active bodies. KBH: What can you tell me about the research you did for the exhibition? How was the work divided between the students in class? 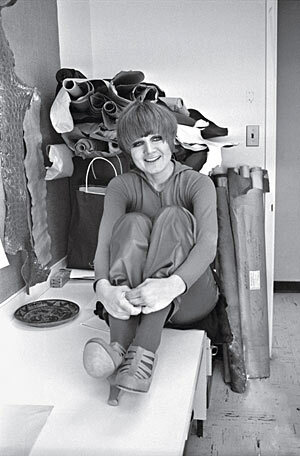 CZ: A lot was happening in the 1960s, so we initially divided it into different subjects, so people were looking at artists from the time, musicians, journalists, photographers, fashion designers, style icons, and trying to get an understanding on really who were the image makers of the decade and who was responsible for this youthquake revolution. TJ: In the beginning, everyone in the class did research, and then when we broke off into our more specific roles, Cassidy and I, as the curators, continued to research and we also had a team of three researchers to whom we assigned both subjects area and particular publications and certain types of media. CZ: Life magazine was a really surprising find for us, there are a few examples featured in the exhibition, so where you might expect to see Vogue or Harper’s Bazaar you really see Life magazine, which has a broader readers base. [The examples in the exhibition] show this kind of democratization that happened in the fashion in the 1960s. Life was at the fore front of the revolution, they were reporting on Mary Quant as early as 1961 and their fashion editor, Sally Kirkland, really had an eye for what was happening internationally. KBH: How were the tear sheets chosen? CZ: It was about impact, how can you portray these concepts immediately, without even saying anything? TJ: Because we had limited space and limited budget every object had to count and had to make its point emphatically. We went for the most iconic things. 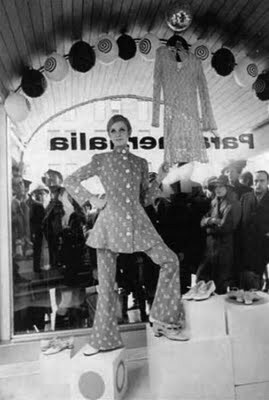 There were certain people we knew we wanted to include like Mary Quant, André Courrèges and Twiggy. Also we wanted to represent certain photographers like Bert Stern, William Klein, and musicians like Françoise Hardy and we have the Rolling Stones in a fashion spread. CZ: And also they served us where we wanted to represent a really iconic designer, Mary Quant for instance, was very influential on designers of the 1960s, we did not have an object that we could show from her so we decided to show a photograph. 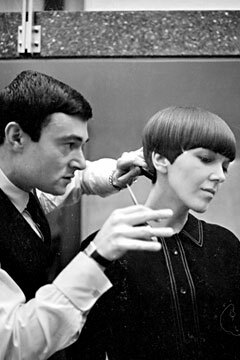 TJ: In the case of Mary Quant it was almost better to have the photograph because we got to show her kneeling amongst her designs, she is wearing a very quintessential Mary Quant dress and she has a Vidal Sassoon haircut. 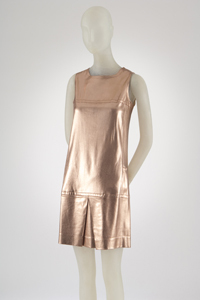 We have a wonderful Paco Rabanne evening bag [in the exhibition], but of course he also did dresses, which were arguably even more revolutionary. The examples that MFIT has are too fragile to be shown, so we were able to represent that in a tear sheet which was also a wonderful opportunity to show Donyale Luna, the first African American model to appear in Vogue. KBH: What are some of the other objects in the exhibition? CZ: There are over thirty objects and mixed media throughout the exhibition, and that includes tear sheets, videos, garments and accessories. The garments and accessories are pulled exclusively from the Museum at FIT’s extensive collection of over 50,000 objects. Objects selection was one of the most fun and probably, at the same, the hardest. MFIT has such a vast collection of 1960s fashion and there are so many designers, so it was really a matter of pin pointing who were the most influential designers, and how can we display key concepts with the eleven mannequins we have. TJ: Half of the garments on display were never before exhibited, so it was a wonderful opportunity to juxtapose mass market items that seem very humble, but they tell an important part of the story of the mass production and they are made of fabulous materials. One of my favorite items are the Miss Wonderful boots, they are tight-high vinyl bright yellow boots, they actually look like they are still wet. They really show you in a snap shot how short the skirts are getting, how the emphasis is on leg, and how materials like plastic is now heralded for what it is, it’s something desirable, it’s not replacing leather it’s actually what people want to wear. CZ: This idea of new, unorthodox materials being introduced into fashion was something that was an innovation of these young youthquake designers. You are seeing all these concepts that are originating with this new generation of young designers who were coming straight from art colleges, and fashion design schools and bypassing traditional apprenticeship programs and opening their own businesses, they have small overheads, inexpensive shops to rent, so they are proving to be breeding grounds for innovation. You have all these radical new styles, like mini skirts and pant suits for women, as well as these introduction of unorthodox materials in fashion. We were very fortunate to interview Betsy Johnson who started her career at 21, she was hired as in-store designer for New York’s groundbreaking Paraphernalia boutique. She really is known for her innovative use of material, using plastics and metals. She says that this was the most exciting time of her work life. 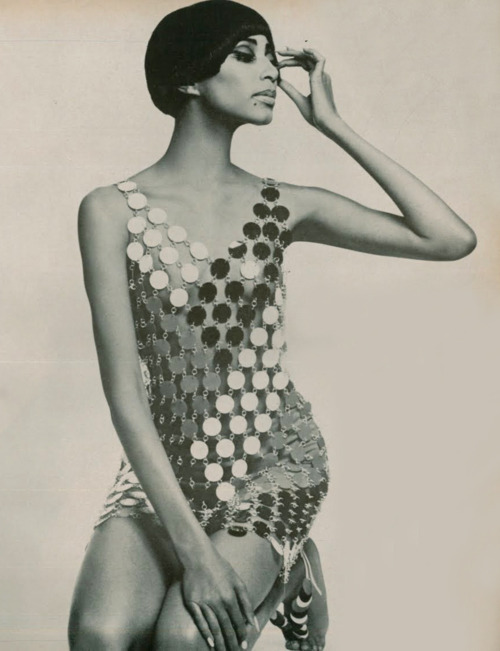 This entry was posted in Exhibition, interviews and tagged 1960s fashion, André Courrèges, Betsey Johnson, Donyale Luna, Life Magazine, Mary Quant, MFIT, Paco Rabanne, Paraphernalia, Twiggy, Vidal Sassoon, Vogue, Youthquake. Bookmark the permalink.